Some are calling this Super Saturday. It’s the day we all have been waiting for. 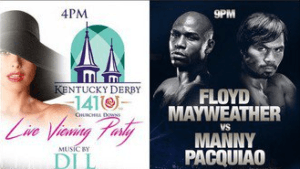 First up we have the 141st Kentucky Derby at Churchill Downs, and then in the evening we have the Fight of The Century between Floyd “Money” Mayweather and Manny “Pacman” Pacquiao. It’s going to be a great day in sports and no better way to kick off the Spring sports betting season! Before we get into the thick of it we have some funny news to share with you. Did you know that Floyd Mayweather just promised to pay Suge Knight’s $10,000,000.00 bail if he wins the fight? That means basically he is throwing away $10 million dollars because when Suge is convicted Mayweather will not get that bail money back. WOW. Moving on, the 141st Kentucky Derby will be televised as always today on NBC. Bob Costas will be our man again prepping us for the race and reporting on injuries. If you have yet to place your bets on the Mayweather-Pacquiao fight or 2015 Kentucky Derby, you can do so now by visiting the Boada sportsbook. Bovada allows you to bet on all sport events from just one account. Current betting favorites to win the Kentucky Derby are Dortmund sitting at 3/1 betting odds with American Pharoah at 5/2 wagering lines and Carpe Diem at 8/1 odds. This is going to be a close race coming down to the wire like true Kentucky Derby fashion. Our Kentucky Derby online betting picks for today’s race are Dortmund to Win, American Pharoah to Place, and finally Carpe Diem to Show. Ship it! Whether you agree or disagree with our Kentucky Derby betting predictions we want to hear about it so post below. Also, we are putting our money on Mayweather to win tonight as well, whether the fix is in or not. There you have it ladies and gents, free Kentucky Derby betting and boxing picks that will have you giggling all the way to your sportsbook.